1) Monoplanes must have a wingspan of at least 80″. 2) Biplanes must have a wingspan of at least 60″. 3) If none of the above is true, the airplane MUST be a true 1/4 scale. If an airplane does not meet at least one of the four criteria above, it will most likely not be considered giant scale. What is This Article’s Purpose? The purpose of this article is to help build on the base of my first article. We’ll continue here with 50-70cc airplanes, and the third article will cover 100-120cc aircraft! Now, as much as I would love to keep going, the largest plane I’ve had to date is a 30% scale Stearman biplane. I’m going to stick to what I know…. Hopefully, I’ve got your interest piqued – if so, read on! The first thing you’re going to want is a relatively large building/assembly area. I have a shop in my basement, and I will admit that it’s not nearly as large as I’d like, but it gets me by. Unfortunately, I am limited to 7 foot ceilings in my basement, so assembling large airplanes can get a little difficult. Many of my larger projects have their final assembly done out in my garage. My bench is a full 4 feet wide by 8 feet long, and was made by me. 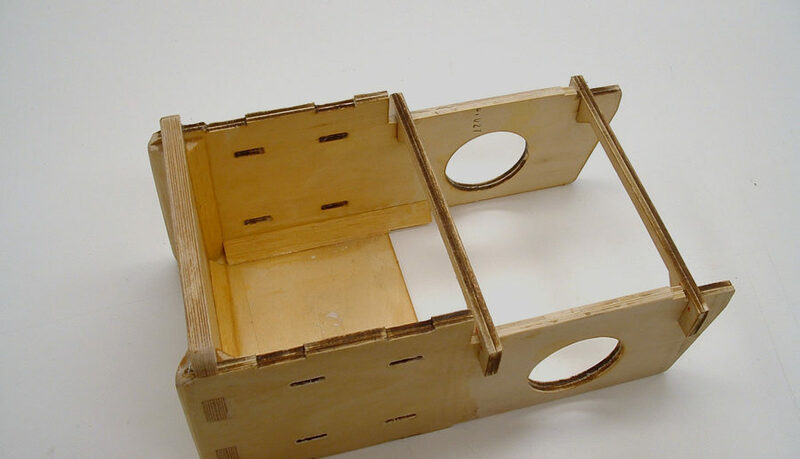 The frame is made from 2×4 lumber standing on edge, with a sheet of 3/4″ OSB (chip board) on top of the 2x4s. A 1/4″ Melamine top layer makes for a nice bench top, especially for all the photo work I do. 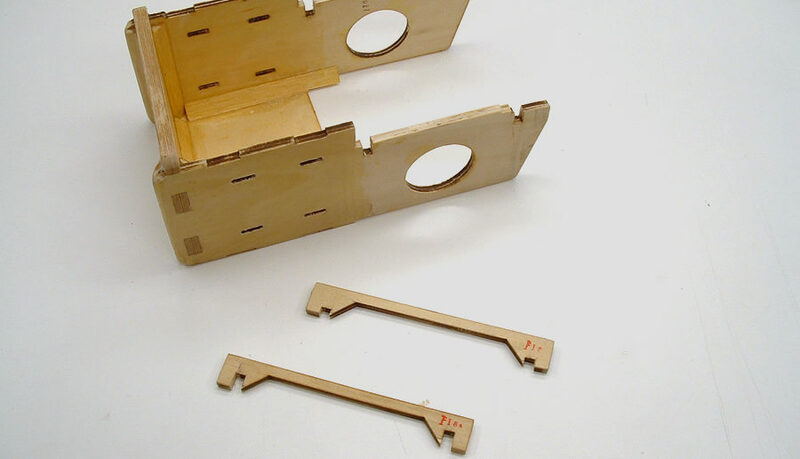 The legs are made of 2×4 lumber as well, and screwed together in an ‘L’ configuration. I’ve used this bench for close to 10 years now, and it’s still flat – If I ever need to true up the top, an additional frame member can be added with two more legs. In my first article I used the Great Planes Avistar 30cc ARF. With a 96″ wingspan, it’s longer than the 85″ wingspan of the 50cc 29% CAP 232 from The World Models I’ll be using in this article. But, that’s the only part of the Avistar 30cc ARF that is bigger than the CAP 232. So, moving the wings around in my shop was a little bit easier with the CAP, but the fuselage was longer and much heavier. This made maneuvering in a small space slightly difficult, but still manageable. As I said earlier, this article will carry on from the first, meaning that you shouldn’t forget about all the things I mentioned in the first article! A lot of what you’ll need for the 50-70cc aircraft will be very close to what we covered in the 30-45cc article. Things that are different, and things that I feel are important will be covered here. 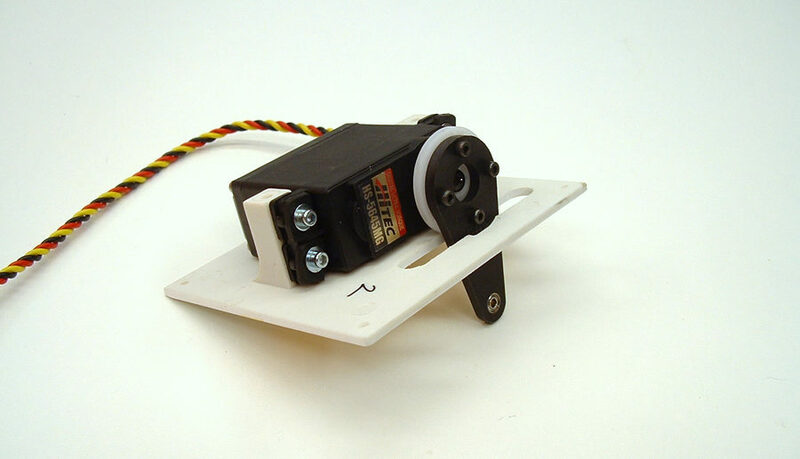 For some of you, this type of servo setup will be TWO firsts – first time using a round servo wheel (you know the one that’s included with every servo you purchase, but it ends up in a miscellaneous box in your shop), and the first time using a servo arm extension that is attached to said servo wheel. 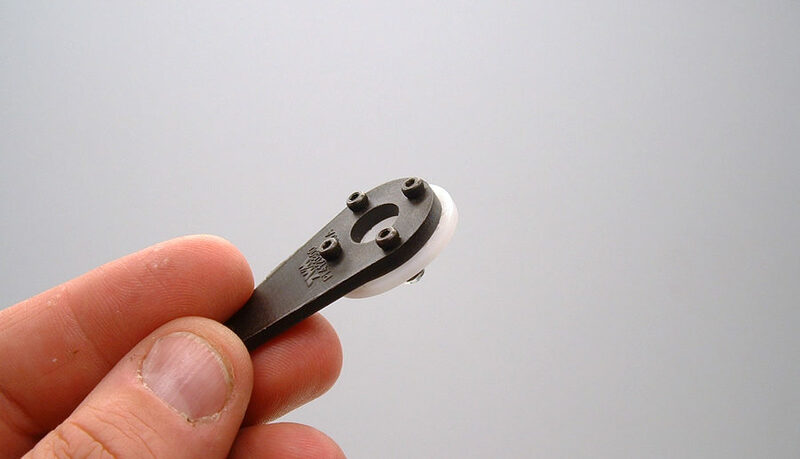 For the World Models CAP 232, these arm extensions are attached to the wheel using four small machine screws and locking nuts. In order to correctly install this extension, the servo must be first centered using the radio system or a powered servo tester. 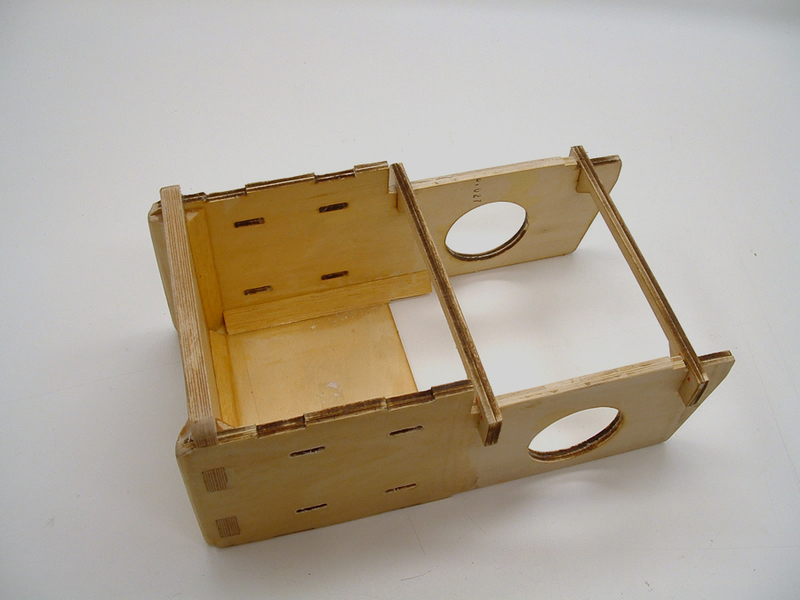 With the servo centered, the arm extension is set in place and the four holes are marked and drilled. 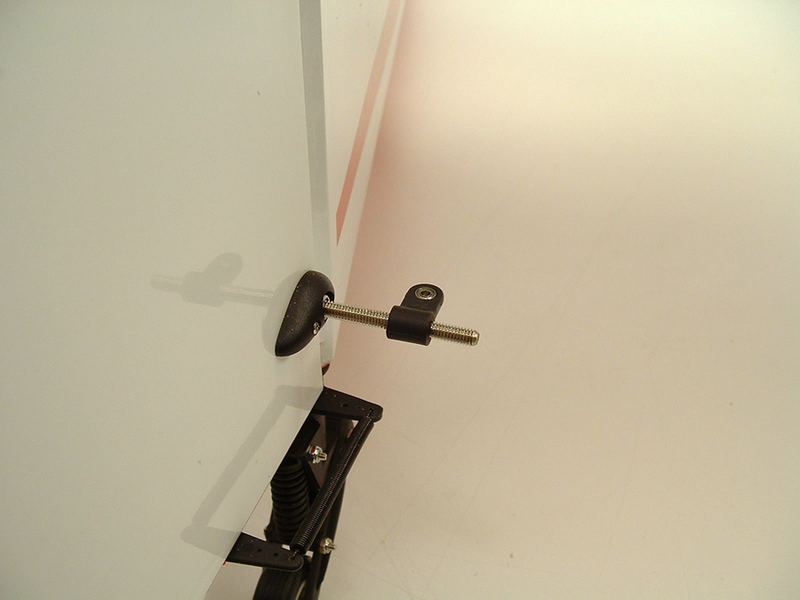 The machine screws and locking nuts are then installed to secure the arm extension. It is also important to note that, even though these are locking nuts, I still added a drop of the blue thread locking compound to each machine screw before tightening the nut in place. For most of us, it’s just a habit to allow space between the servo and it’s mounting hatch, but I’m going to mention it here. If you’ve only run electric powered airplanes prior to making the jump to giant scale, you might not be familiar with this step. It is imperative to keep a gap between the servo and its hatch. 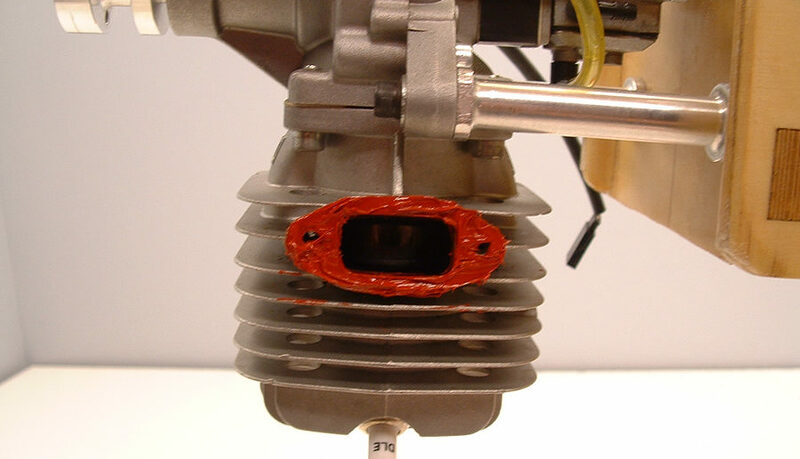 This minimizes the amount of vibration transferred from the airframe/engine to the servo. Some people use an old card, such as a hotel key (keep these as frequently as you can – they come in handy for SO MANY THINGS! 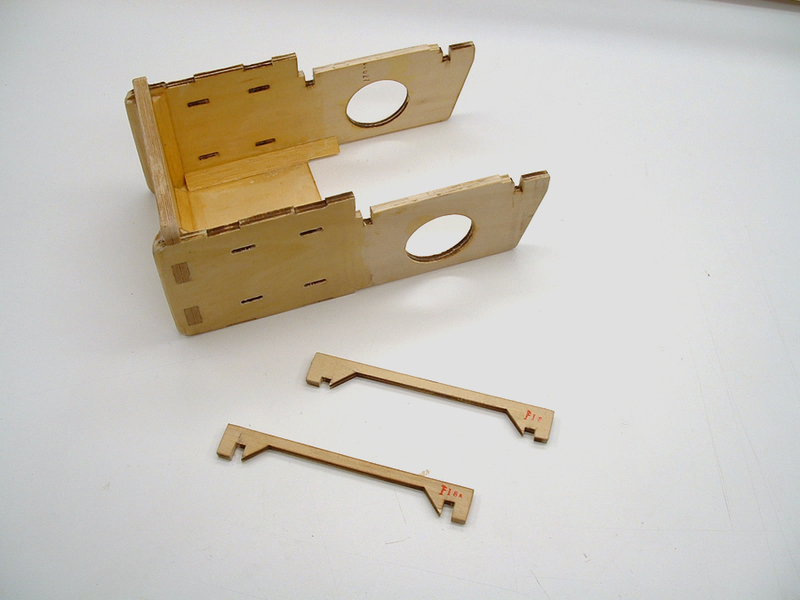 ), but I prefer a 1/64″ piece of aircraft plywood. 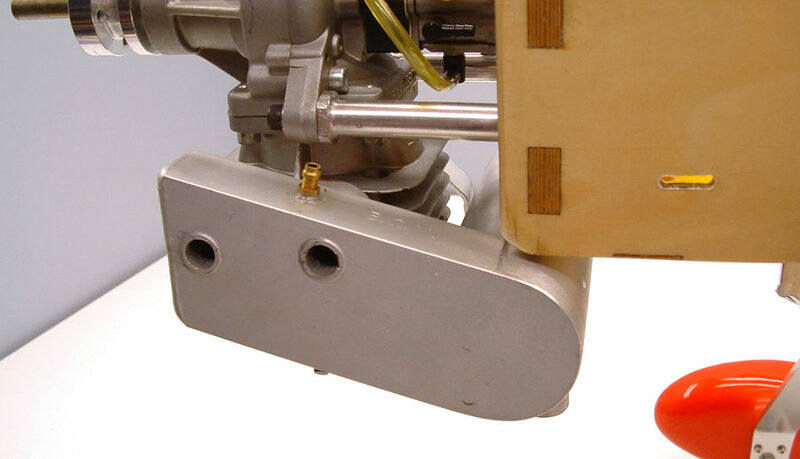 It has been cut to the width of a standard servo, and is approximately twice as long as the servo is tall. 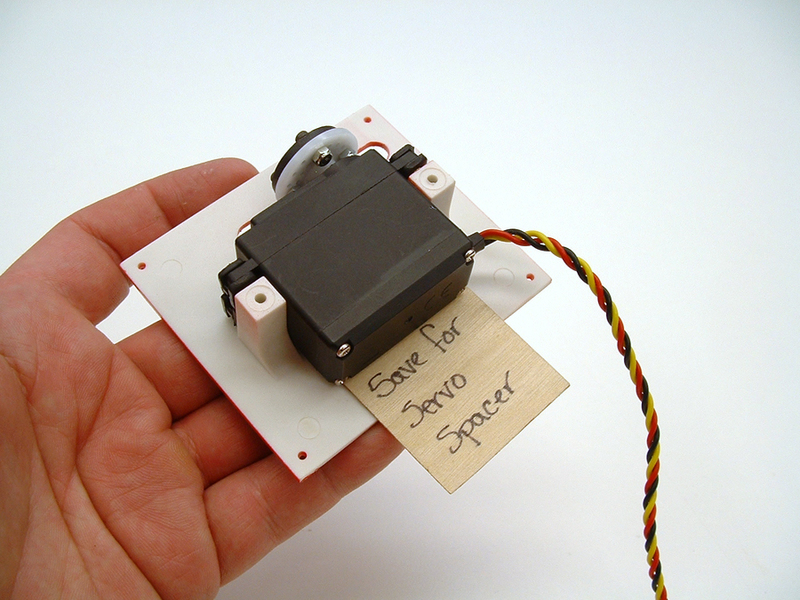 As you can see, I have also written ‘Save for servo spacer’ on it, so it doesn’t accidentally get thrown out when I’m cleaning off the work bench. The servo is attached to the hatch with four servo screws, again, I really like the DuBro Socket Head Servo Mounting Screws. The socket head makes them much easier to get installed (and removed if necessary) than a traditional Philips head screw. 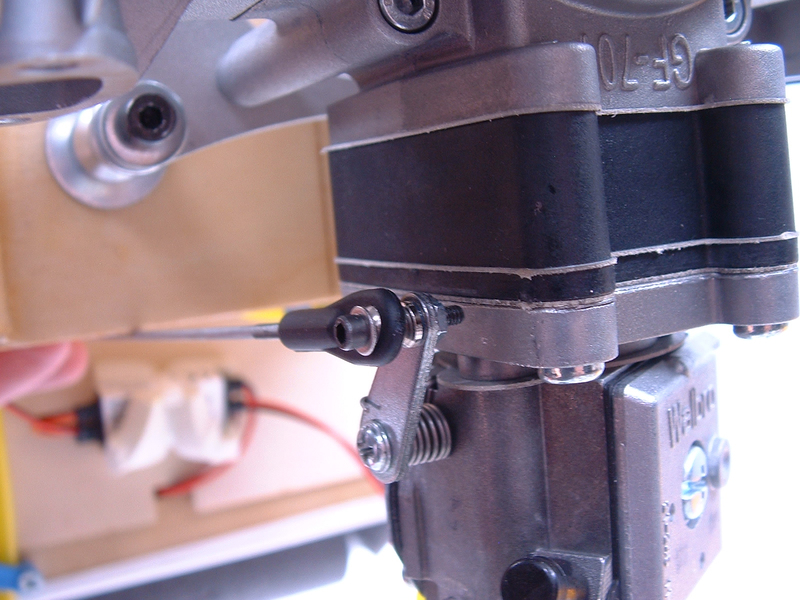 One other thing you’ll notice on this servo arm extension it that there is only one pushrod connection hole – and it has a ball bearing! The World Models does this with a lot of their large scale aircraft. 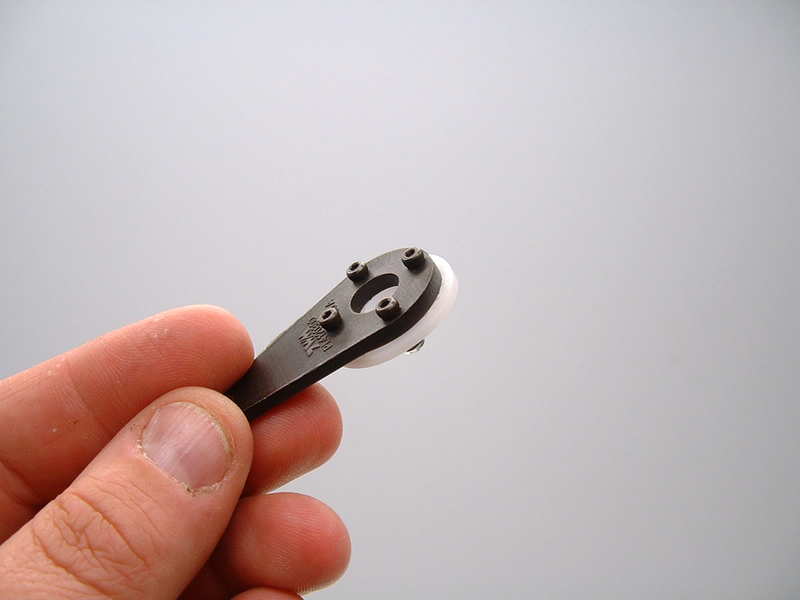 the clevises use a small machine screw and locking nut as the pin in the clevis. This makes for a secure connection that has very little friction! 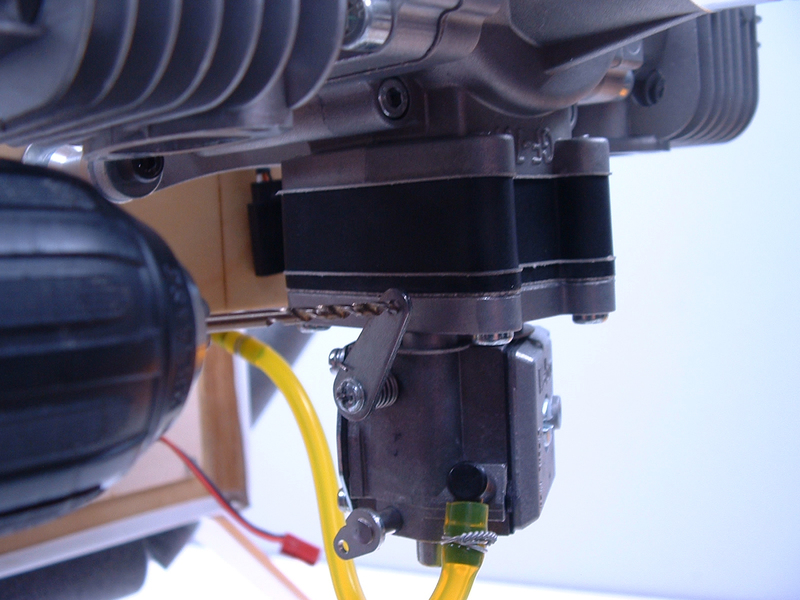 Torque – The torque value (how much force the servo can apply to the control surface) is probably the most important factor in selecting a servo for your giant scale project. 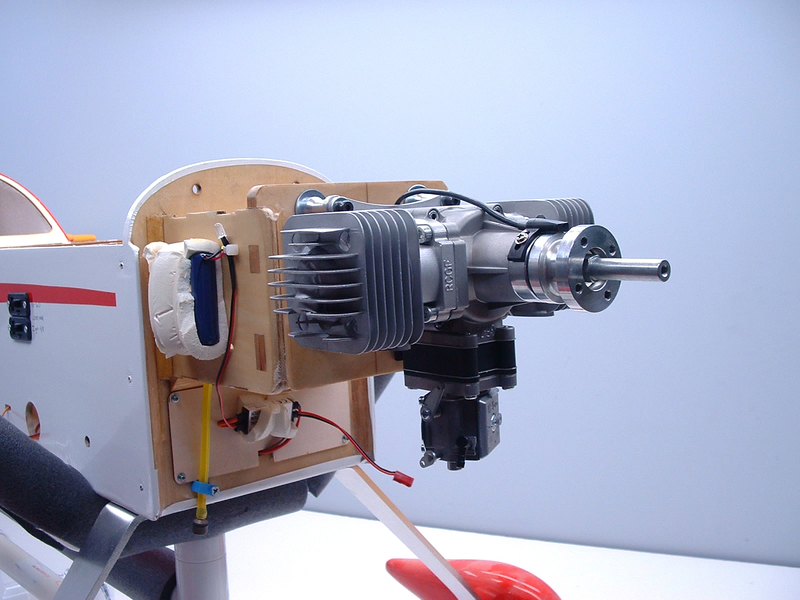 This will vary depending on the project – aircraft with large control surfaces, like 3the CAP 232 used for this article, will need servos with a higher torque value than a giant scale trainer or general sport plane. Both airplanes will require servos with more torque than your standard .40-.60 sized airplane, but the CAP 232 will need more than the sport plane. 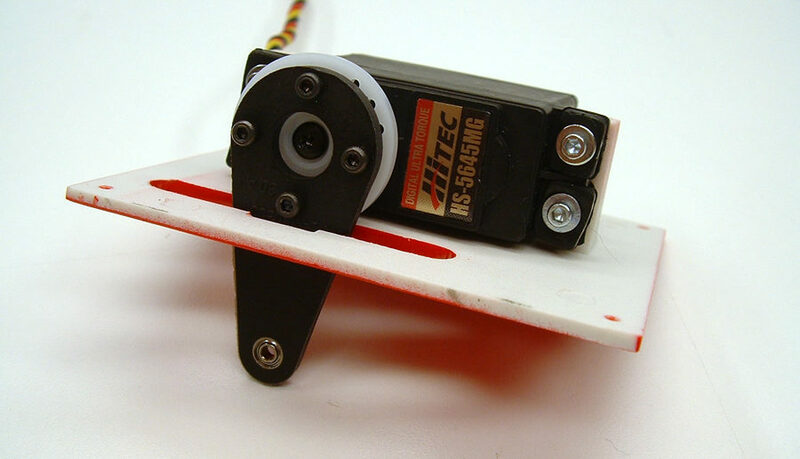 For 50-70cc aircraft, you’ll probably want to look at servos with a minimum torque of 125 oz./in. Operating Speed – Like the torque value, operting speed will vary by aircraft type – an airplane designed to perform 3D aerobatics will need a servo that operates faster than a servo for a warbird or a sport plane. Typical servo speeds are in the range of .18-.23 seconds for a 60° rotation of the servo output shaft, while a high speed servo can rotate that same distance in .13 -.17 seconds. 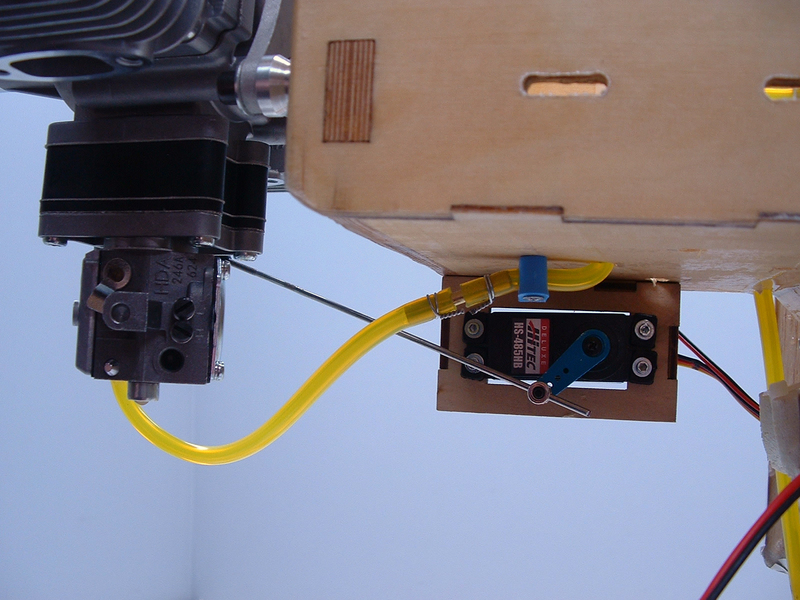 Some servos are even faster! 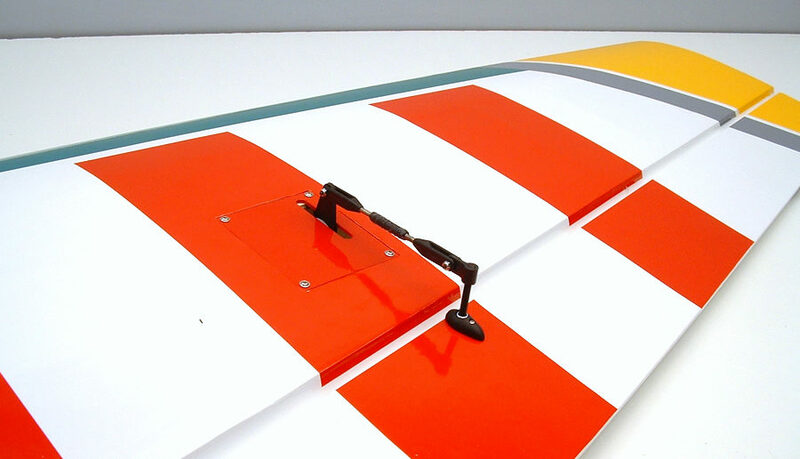 A large warbird or sport plane doesn’t need a servo that moves that quickly. 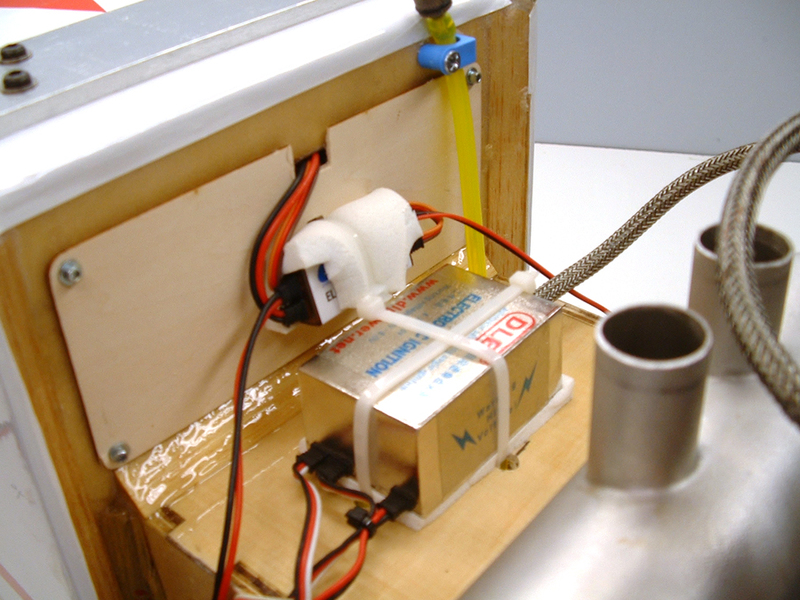 Operating Voltage – This topic is becoming less of a factor, as many new servos have a larger operating Voltage range. 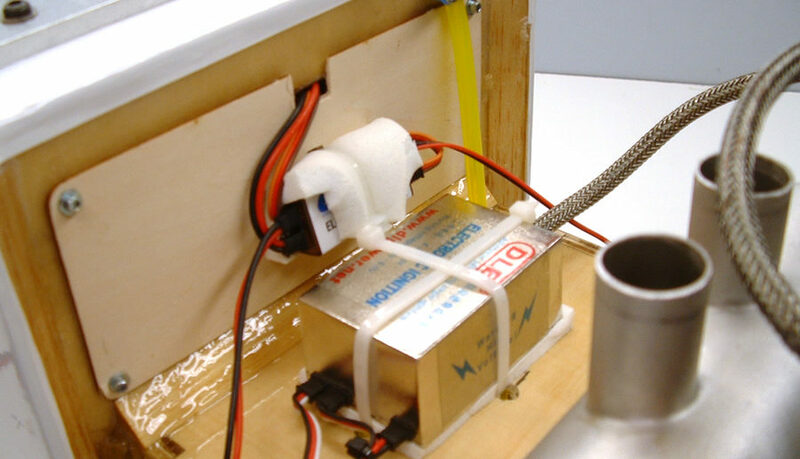 Some servos still have an operating range of just 4.8-6.0 Volts, so you’ll want to choose the servo based on the type of receiver battery you want to use. If you’re going to use a 4-5 cell NiMh battery to power your receiver and servos, then a 4.8-6.0 Volt servo will work for you. However, with newer receivers able to handle an input of 4.8-8.4 Volts, LiPo and LiFe batteries have become a very popular option for flight batteries! But, just because your receiver can handle the extra Voltage doesn’t men the servo can, so choose accordingly. 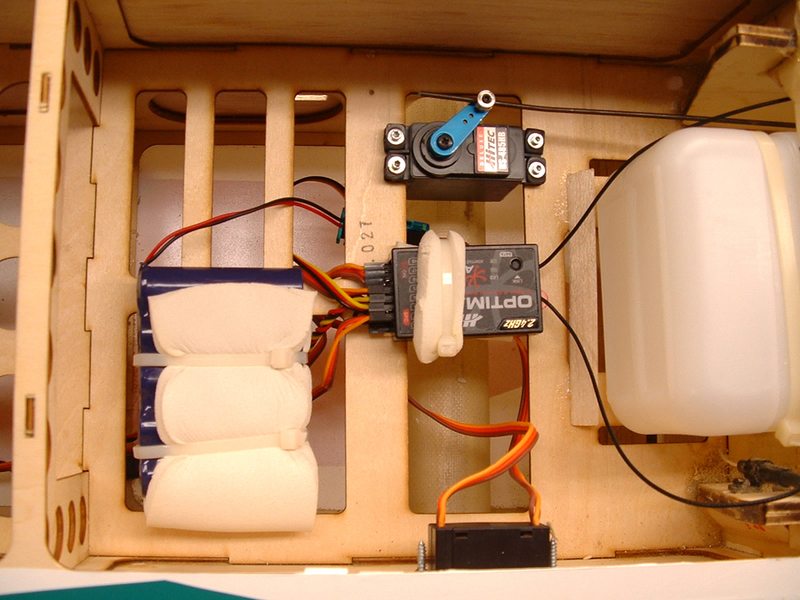 Servos that can handle the higher inputs will be labeled with ‘High Voltage’ or ‘HV’. Analog or Digital Servos and Receiver selection – For the most part, the only reason I’m mentioning this is because there are receivers available that will only work with digital servos. I use a lot of Hitec equipment, and they have receivers that will ONLY work with digital servos. 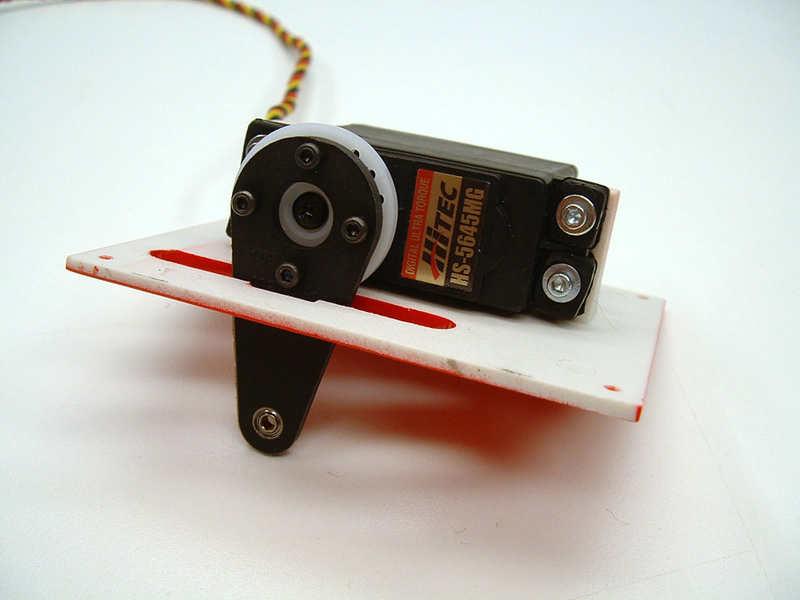 Make sure your servos are compatible with your receiver! Brand and Cost – Lastly, we have brand and cost. 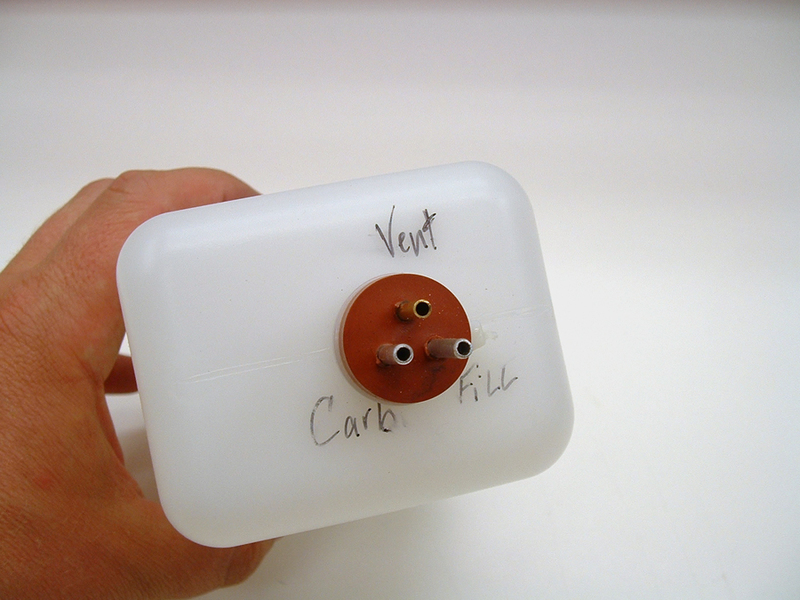 These will go hand in hand, as many name brand servos will cost more than the lesser known brands. 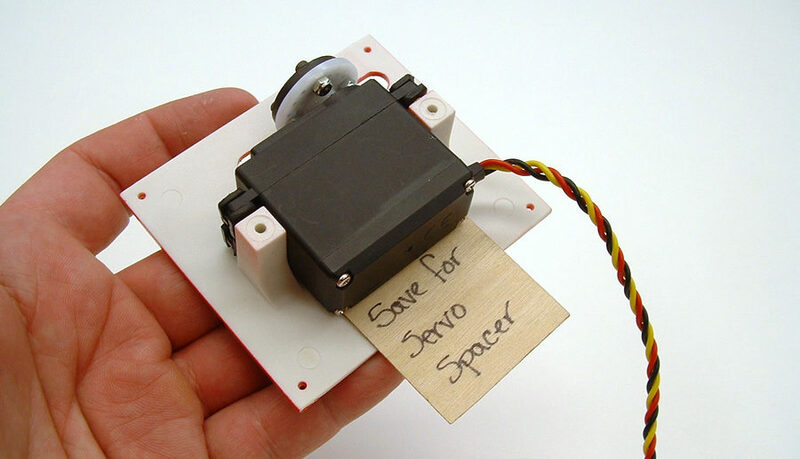 Now, the name on the servo doesn’t automatically mean it’s going to be a better servo – Not all of us can afford to spend $100 plus dollars per servo, but this is why you need to do your research! 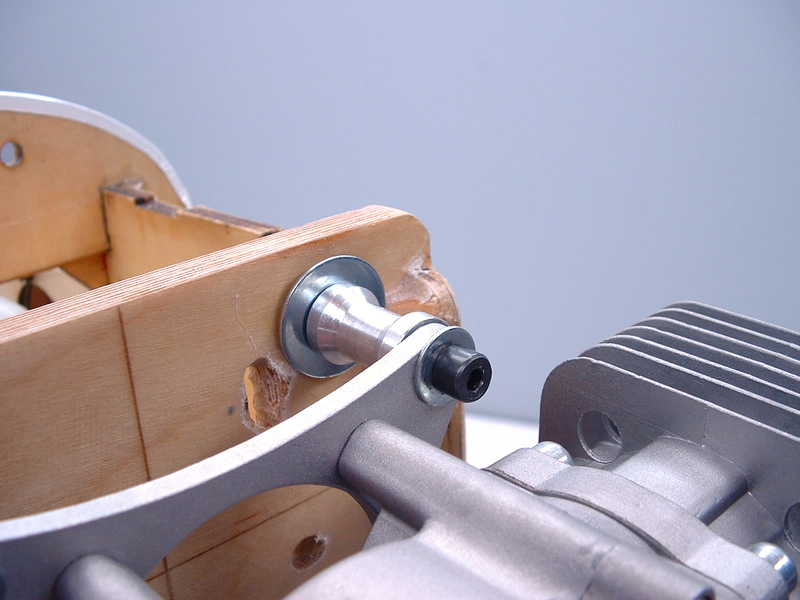 Always, always, always harden screw holes in wood with thin CA – this is very important when working with Internal Combustion engines, and even more so with large airplanes! 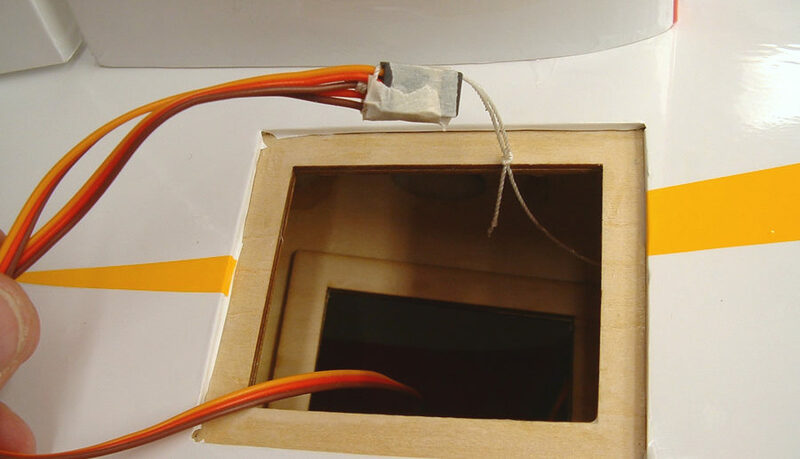 Once the CA has cured, the servo hatch can be installed. As you can see, the control horn on the CAP 232 looks different than what we saw on the Avistar 30cc ARF. 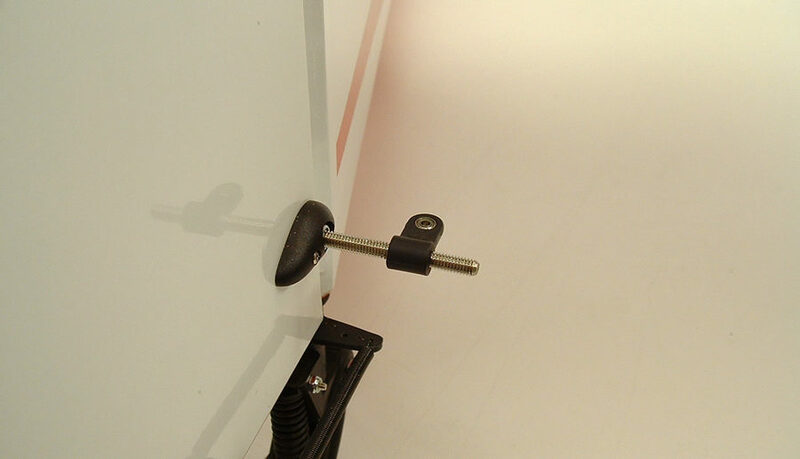 The World Models uses a long machine screw with plates and a locking nut. 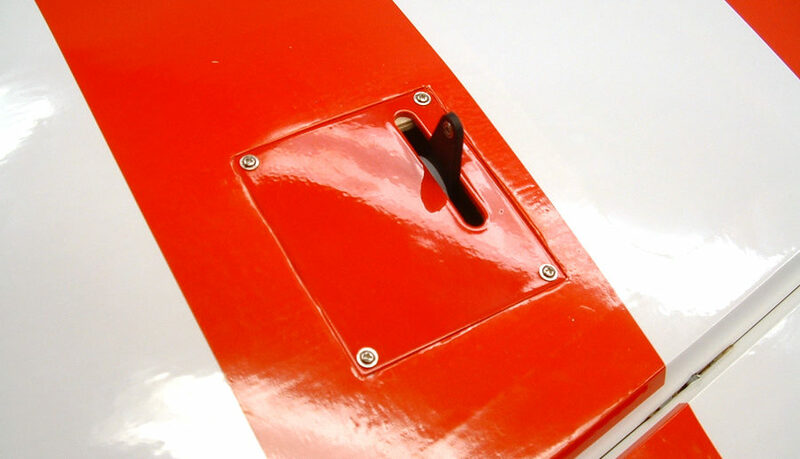 The ‘horn’ is a plastic tab that is turned on to the machine screw, and has a ball bearing in it for smooth, bind free operation. 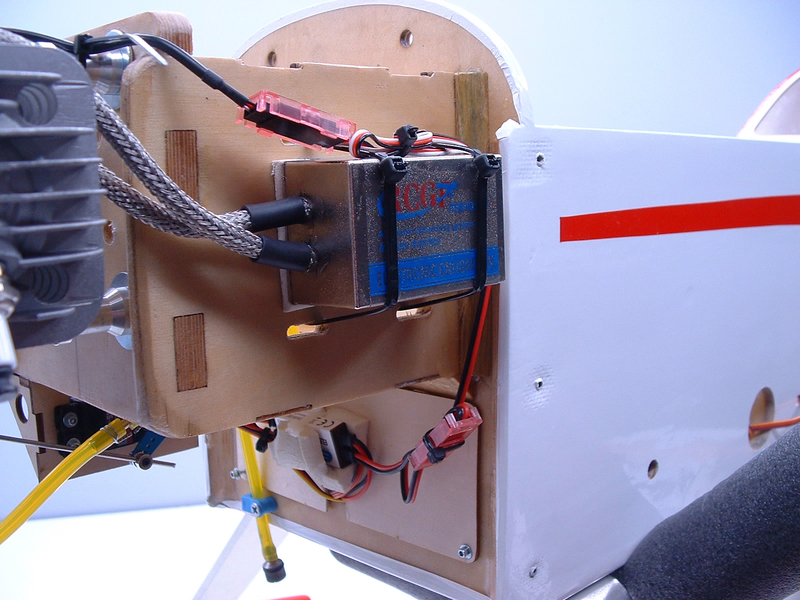 The last photo shows the completed aileron setup, with the servo hatch, pushrod, and control horn all connected as one unit.m It’s a stout, slop free configuration that works very well! If you look closely at the last photo, you can see that he black section of the pushrod looks rough – this is because the fiberglass shaft over the threaded pushrod was splitting at the ends. I wrapped the fiberglass tightly with nylon thread, and then soaked the thread with medium CA. This made for a very tough pushrod! 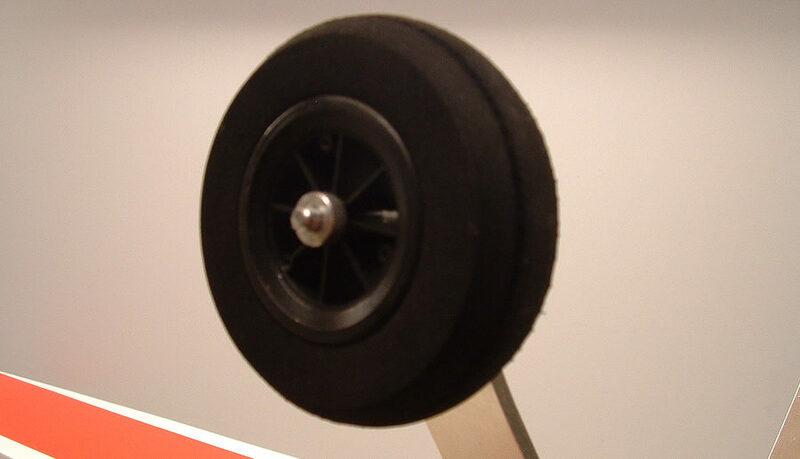 The rudder servo arm extension is attached to a servo wheel like the ailerons, and also has the ball bearings. 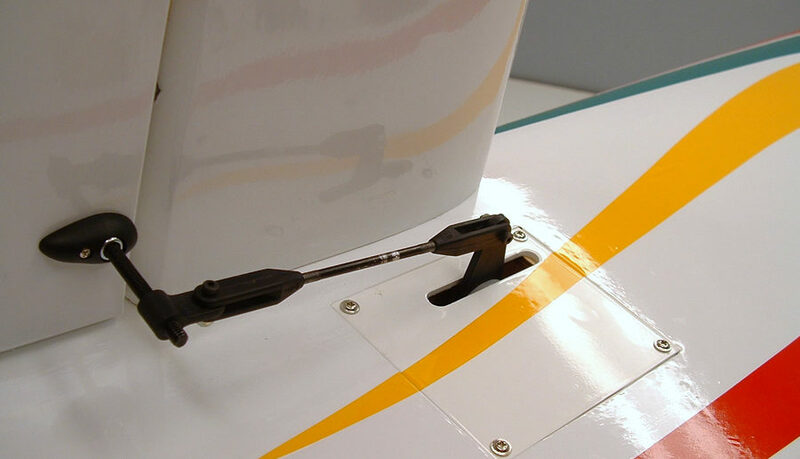 The rudder’s control horn is similar to the aileron setup, except that it is a pull-pull design. 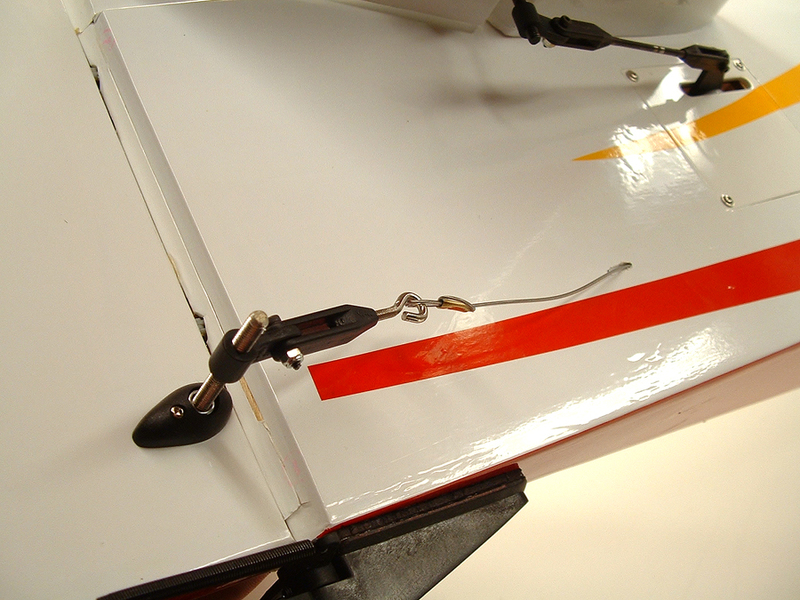 Some of you may not have ever used a pull-pull rudder system, so I’ll break it down a bit. 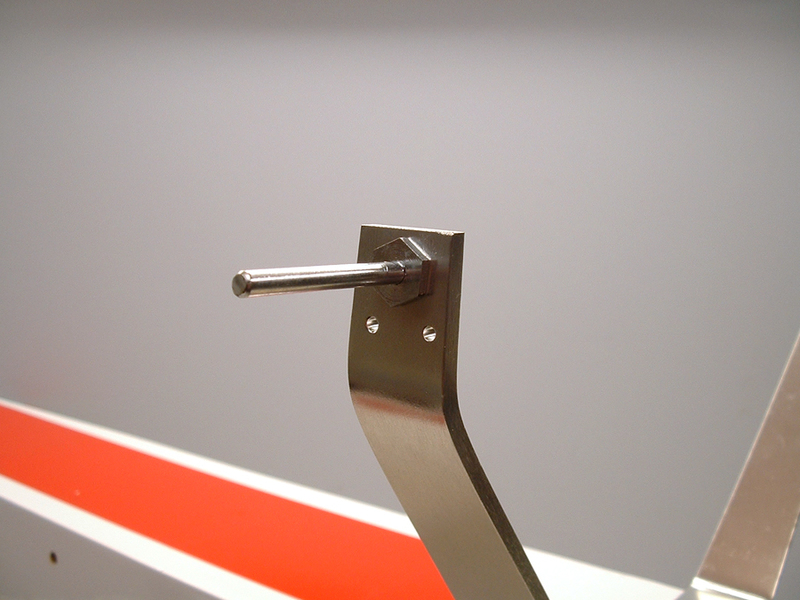 Instead of a solid pushrod, a pair of wires are used to pull the control horn in each direction. 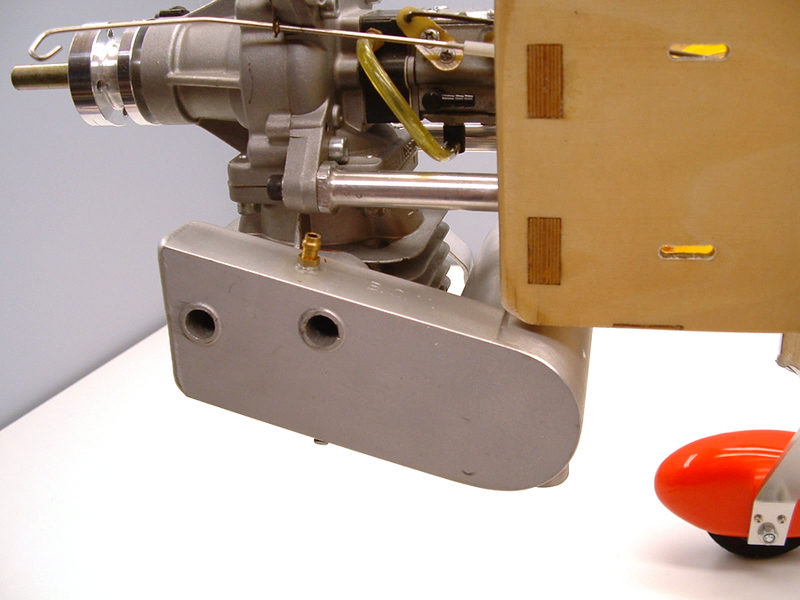 A control horn and cable are used on each side of the rudder to move the control surface. The wires (in this case, they are a nylon coated braided stainless steel wire) is looped through an eyebolt connected to a clevis. 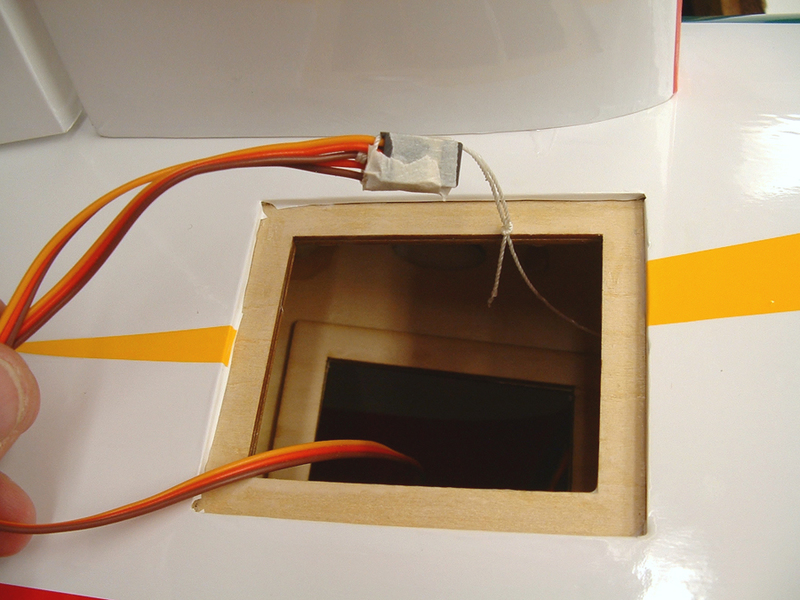 There’s usually just a few inches of extra wire included with the airframe, so you’ll want to make the first connection as close to the end as possible. The clevises are attached to the rudder (again, one on each side) and pulled fairly tightly through the fuselage. 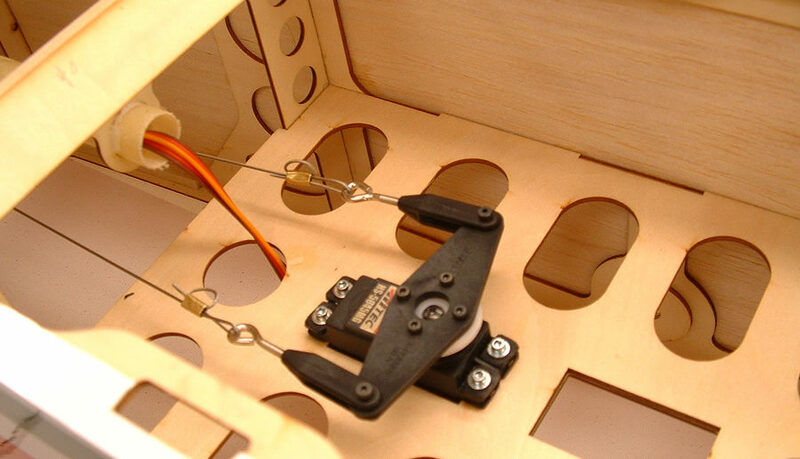 The other end is then attached to the servo arm in the same manner as the rudder. 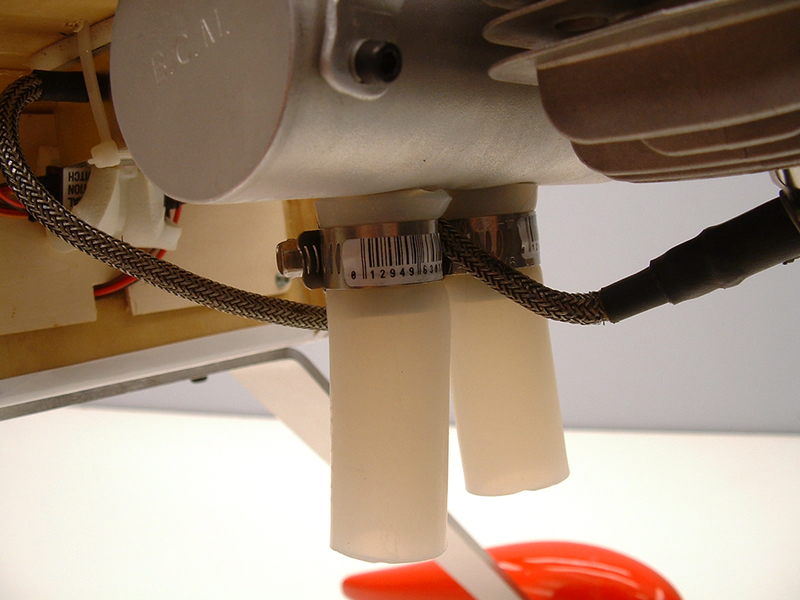 In this particular airplane, the pull-pull wires cross – so the left side rudder connection is on the right side of the servo, and the right side rudder connection is on the left side of the servo. 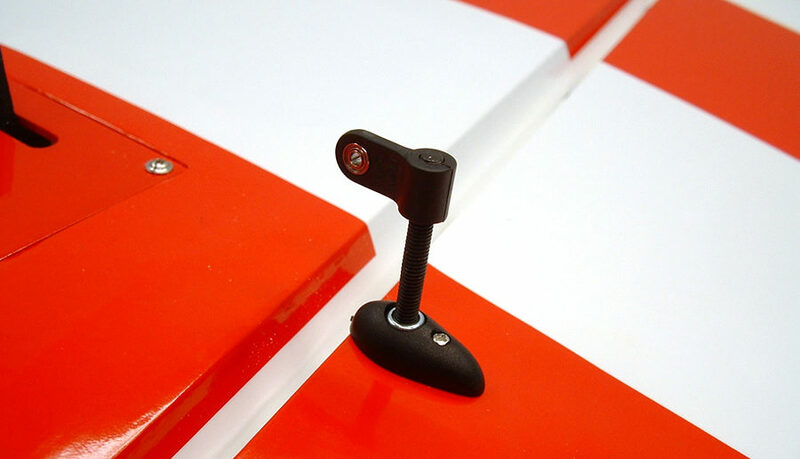 The benefit of this is seen when the wires exit the fuselage at the tail end – they come out at an angle that won’t continuously rub on the fuselage so there’s less binding. 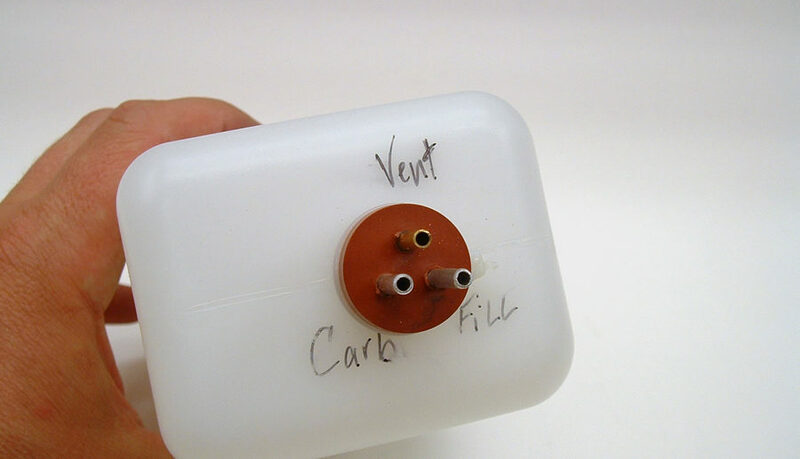 The engine box is not installed in this CAP 232 ARF – A smaller shipping box can be used this way, and it’s pretty easy to install. 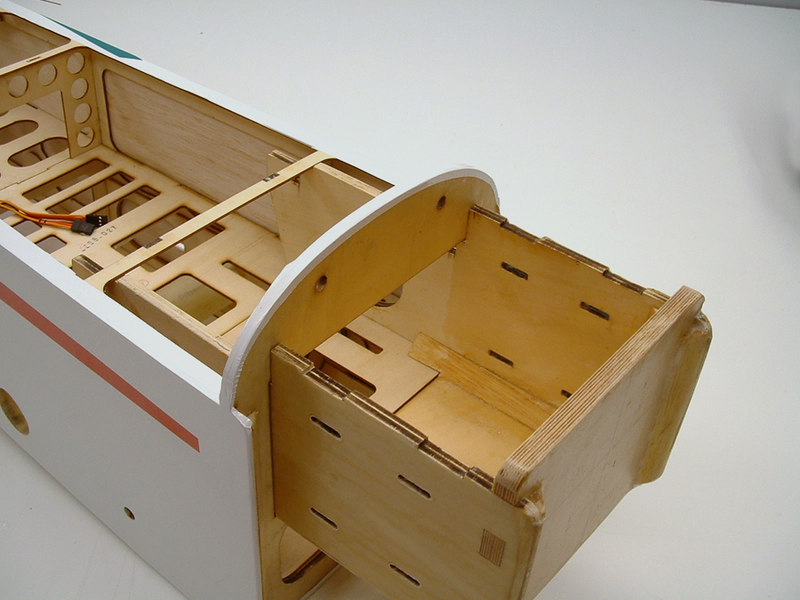 There’s a couple of formers that are glued in place on the top that help to ‘key’ the engine box to the fuselage. Now, when I say ‘glue’, I mean epoxy. 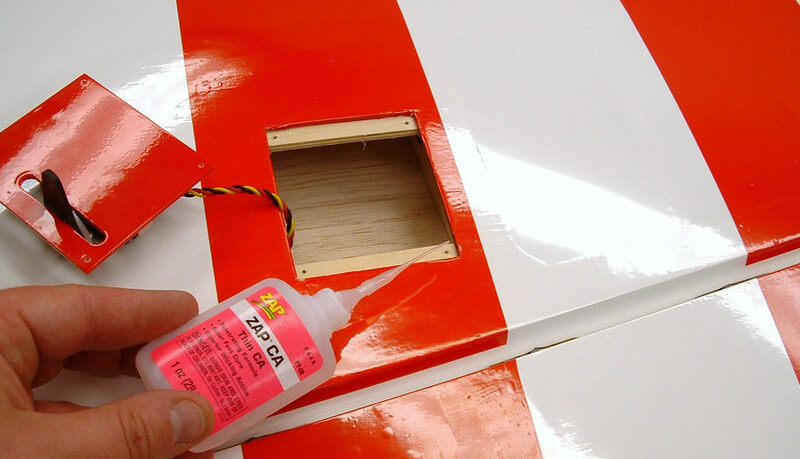 The engine box will get epoxied in place, and you will apply epoxy to every part of the box that makes contact with the fuselage. YOU DO NOT WANT THIS TO BREAK LOOSE FROM THE FUSELAGE!!! Nearly every airframe in this size is going to have at least one servo operating each control surface. For the CAP 232, each half of the elevator is controlled by its own Hitec HS-5645MG servo. 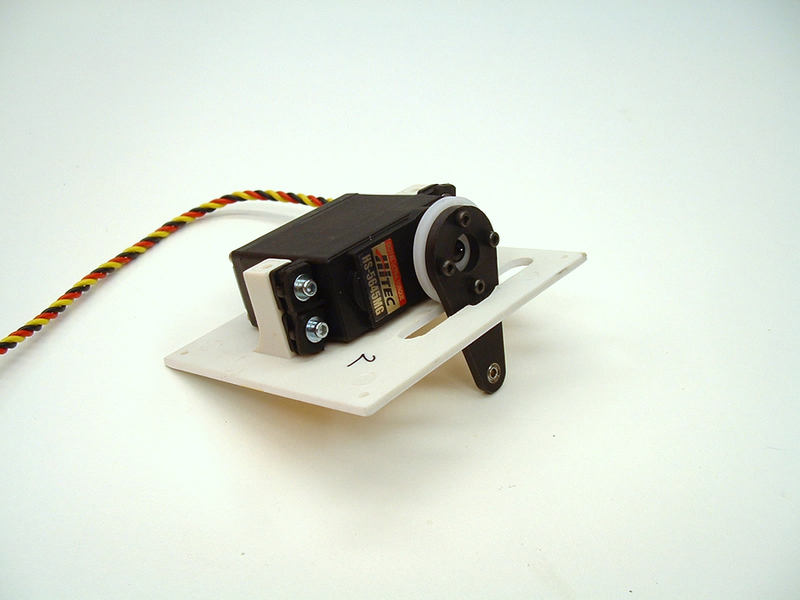 These are high torque, digital, metal geared servos, but are still reasonably priced! 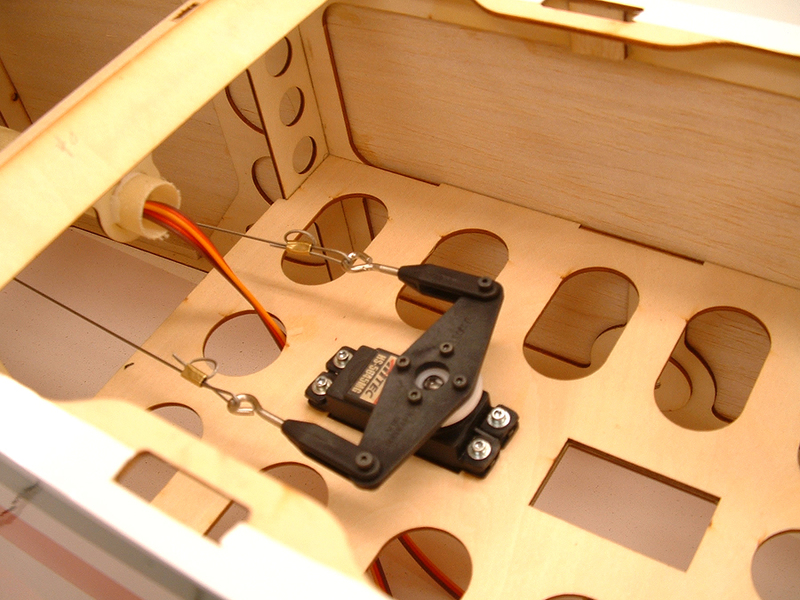 Each servo is mounted to a hatch and has the same slop free setup as the aileron pushrods. 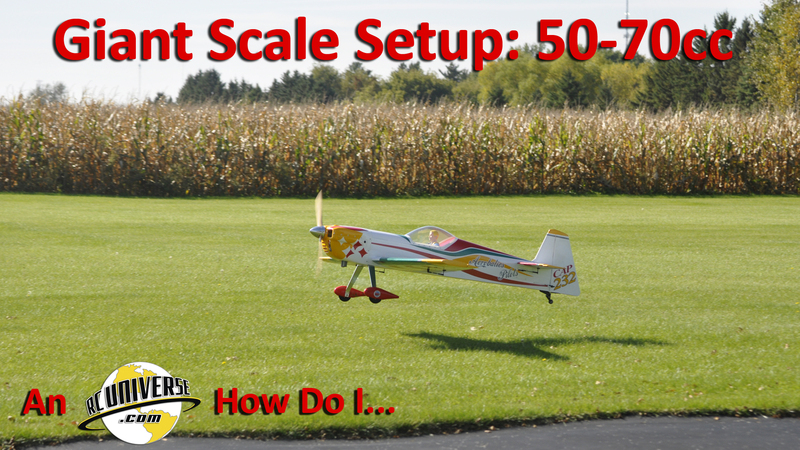 This is a great way to set up giant scale aircraft! 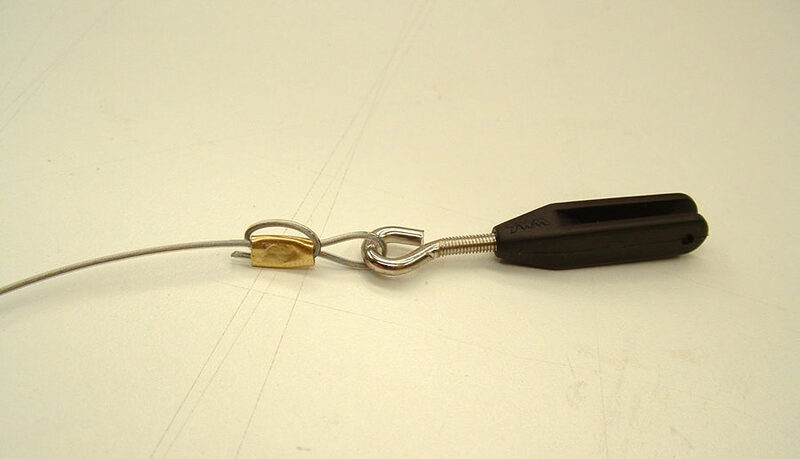 Also, this might be your first model with tail mounted servos – you’ll want to make sure you have servo wire extensions on hand that are long enough (and are heavy-duty wire) to reach from the tail of the plane to the receiver location. 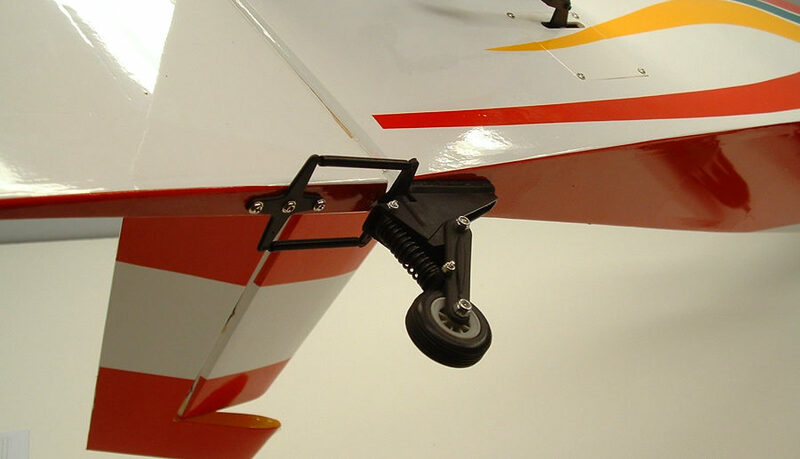 With a 50-70cc aircraft, you’re going to be using some pretty hefty landing gear. 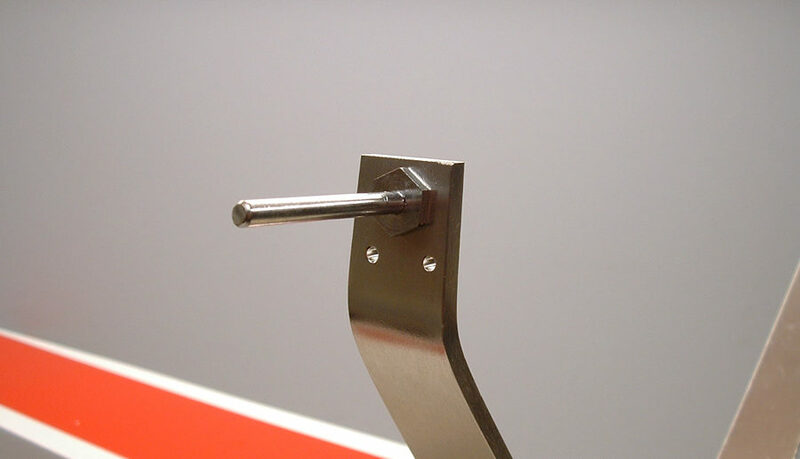 The good news is that it’s attached in a very familiar manner – with screws! 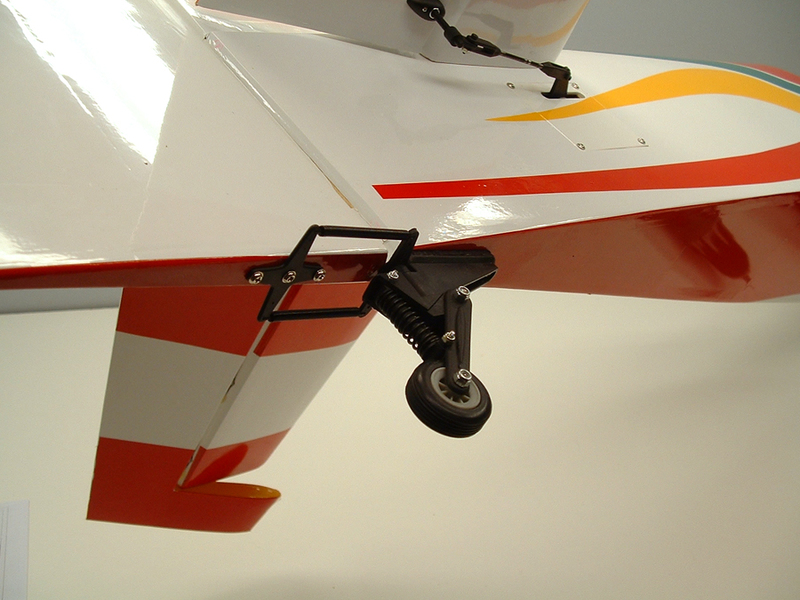 The CAP 232 uses machine screws and blind nuts installed inside the fuselage on a landing gear mounting plate. A good sized drop of blue thread locking compound was applied to each machine screw as it was installed. The axles were then installed and use a large diameter threaded bolt and locking nut. That bolt has a hole drilled through the center, and the axle is welded to the bolt. One extra precaution I take with large models is to grind a flat spot in the bottom side of the axle in the approximate locations of the set screws. this flat spot gives the set screw a better surface on which to ‘bite’. 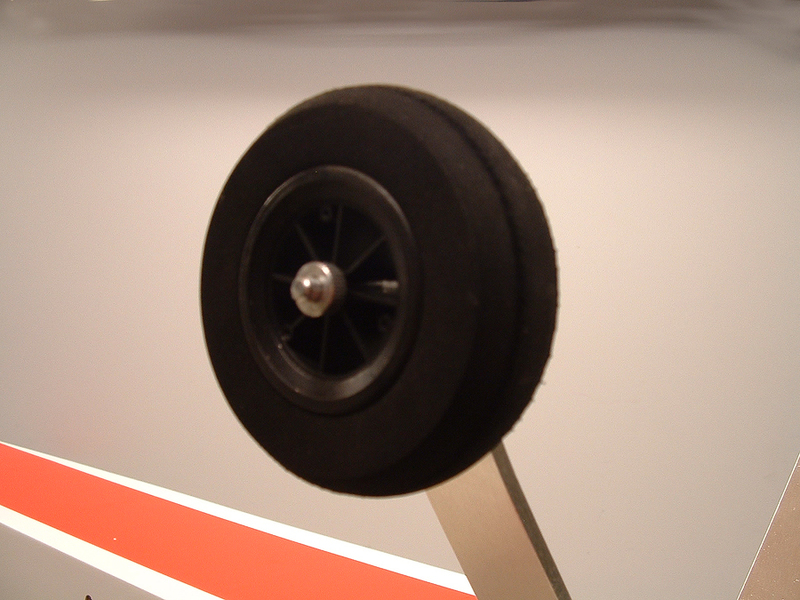 The wheel has a wheel collar on each side – again the set screw has a drop of thread locking compound on it. The CAP 232 has a pretty cool sprung tail wheel assembly, which dampens the amount of shock on the tail while the plane is on the ground. 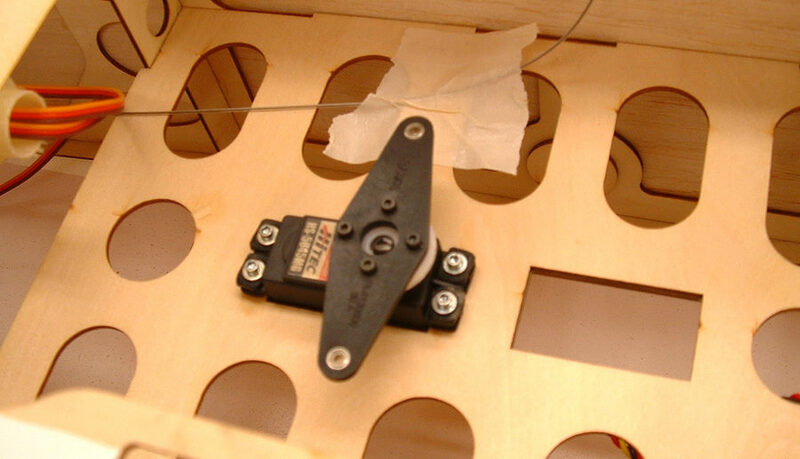 The steerable tail wheel is attached to the rudder by a pair of springs and a ’tiller’ arm which is screwed to the bottom of the rudder. 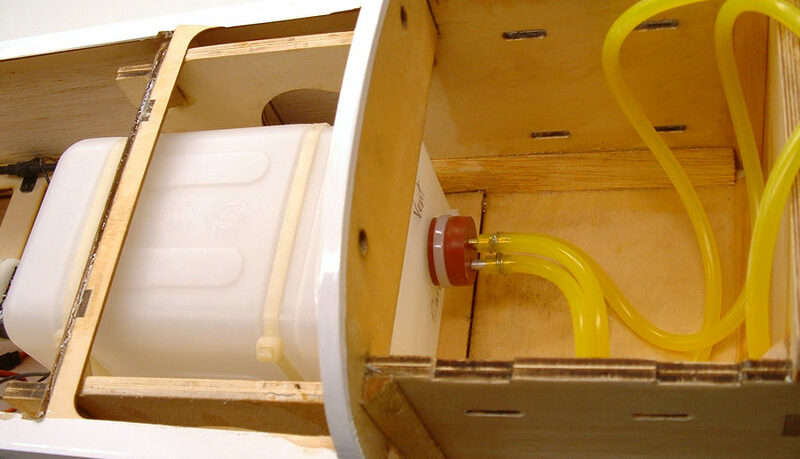 The CAP’s fuel tank was assembled and installed per the manual – there were some really nice spring clips included with fuel tank, and a short section of neoprene fuel tubing for inside the tank. 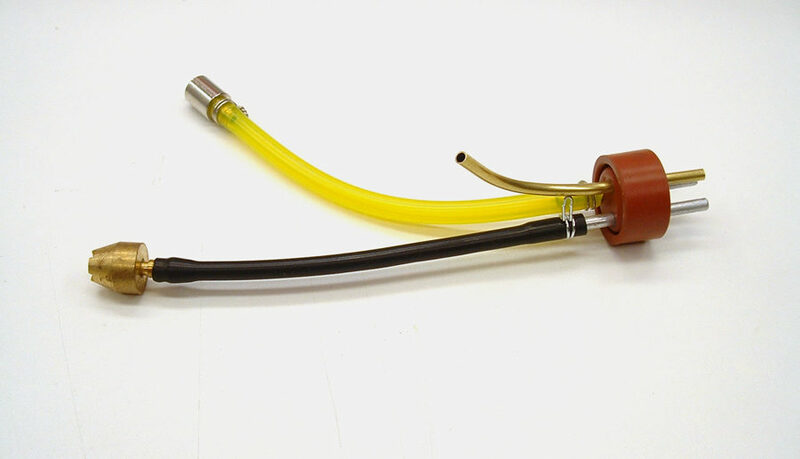 I added a second fuel line and clunk to make filling the tank easier. I used the ‘Fill It’ Fuel System and large Tygon Fuel Tubing from DuBro. A piece of 1/4″ Protective Foam Rubber sits under the fuel tank, which is secured to the tank tray with a pair of heavy-duty Zip Ties. 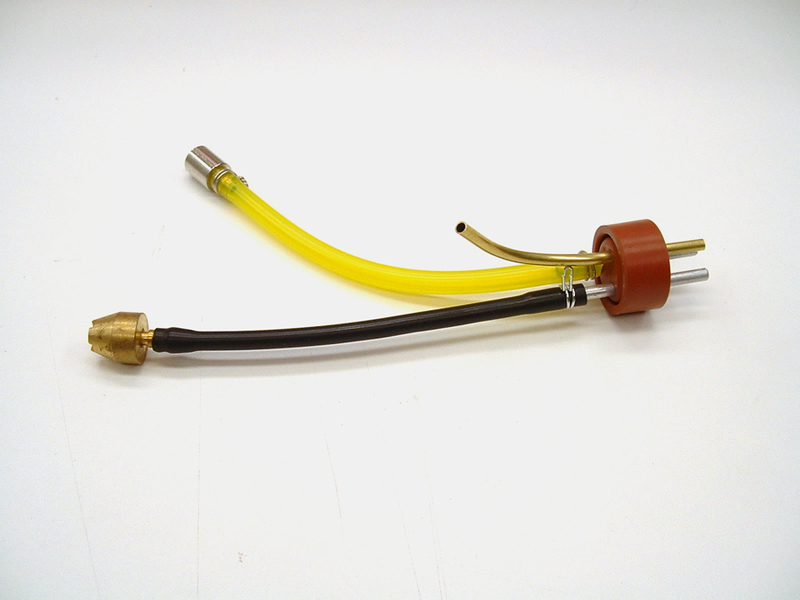 The Tygon Fuel Tubing is secured to the fuel tank aluminum and brass tubes with twisted mechanics wire – I wrapped the wire twice around the fuel tubing and then twist it tightly to secure the tubing. An engine that runs reliably needs a fuel system that is set up correctly! Of course, engine selection is key as well. My World Models CAP 232 has had two different engines installed. 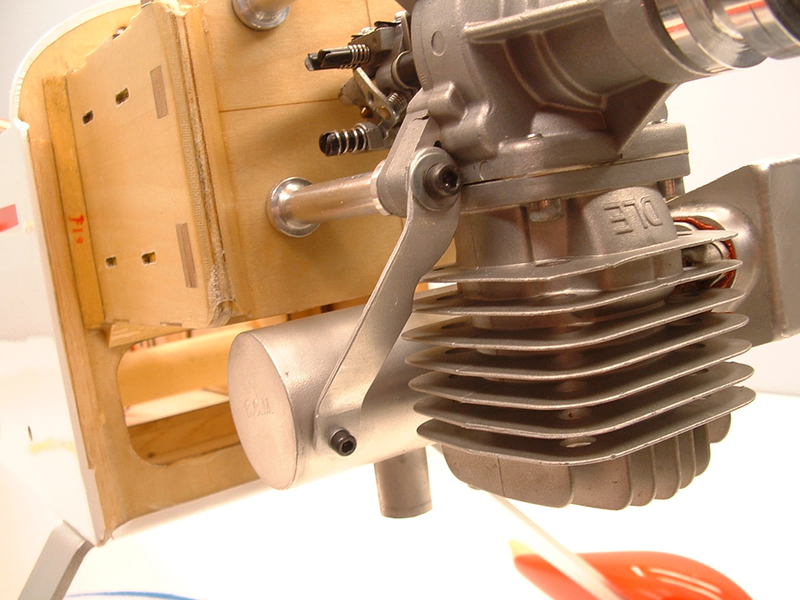 I have used a DLE 55 and the RCGF 70cc Twin cylinder V2. Both are great choices for the CAP 232, as the CAP has a wide cowl – even the twin is nearly 100% concealed inside the cowl. But, beyond just size, reliability is important. 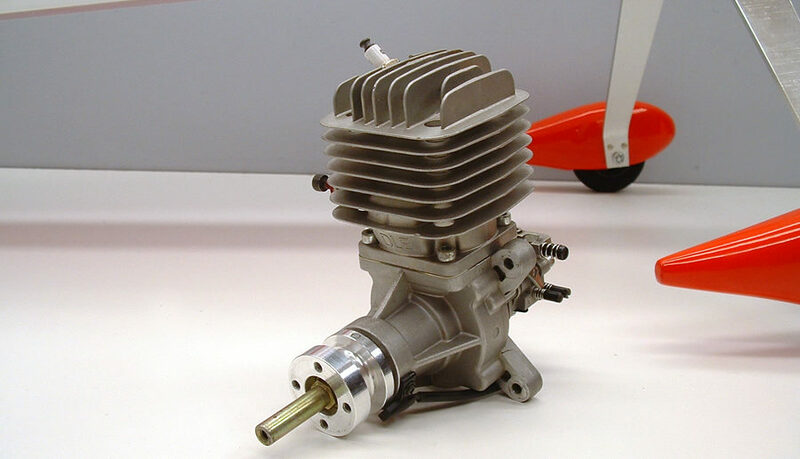 There are several good engine companies making engines in this size range – RCGF, DLE, and DA to name a few two-stroke companies. 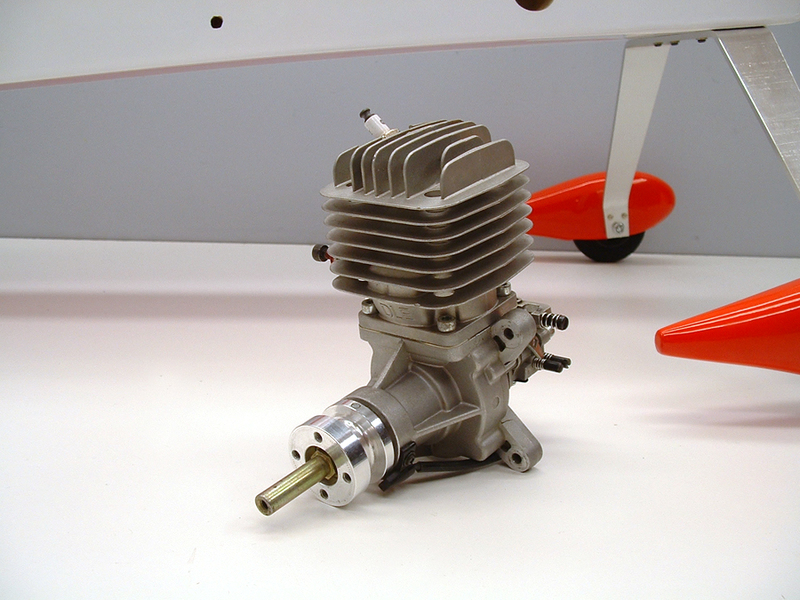 There are also some four-stroke engines available in the 50cc range as well, but they don’t come cheap… Most engines will have a unique mounting pattern, and the overall length of the engine will vary as well – the length is important to note when trying to match an engine to an airframe. Engine weight can also factor into your engine choice – a short-nosed airplane like the Sopwith Pup will require more nose weight than an airplane like the Pilatus PC-6 Porter. The engine length was perfect, so mounting the DLE 55 with its included standoffs was easy. The Bisson Custom Muffler was a tight fit, but it just cleared the firewall! Bisson has a large selection of ready to use aftermarket mufflers, but can also custom make nearly any design to fit your particular need. I have another muffler for the DLE 55 that was custom made to fit between the engine and the firewall of a different 50cc airplane. Check them out when you need a muffler! In addition to the muffler’s paper gasket, I added some high temp RTV exhaust gasket maker. The red stuff is great, and a tube will last for a long time! 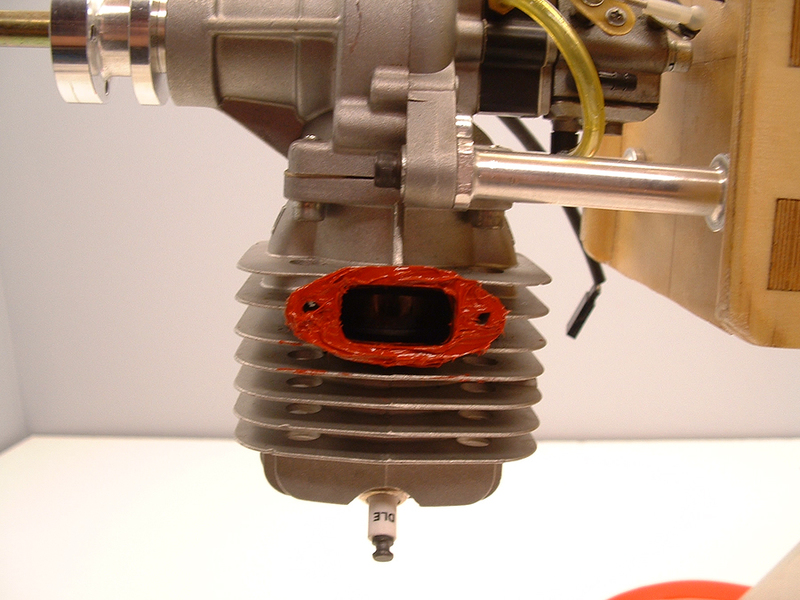 Throttle servo placement can be difficult, depending on the plane and the engine’s carburetor placement. The CAP 232 has a large area to mount the servo, so placement was easy. 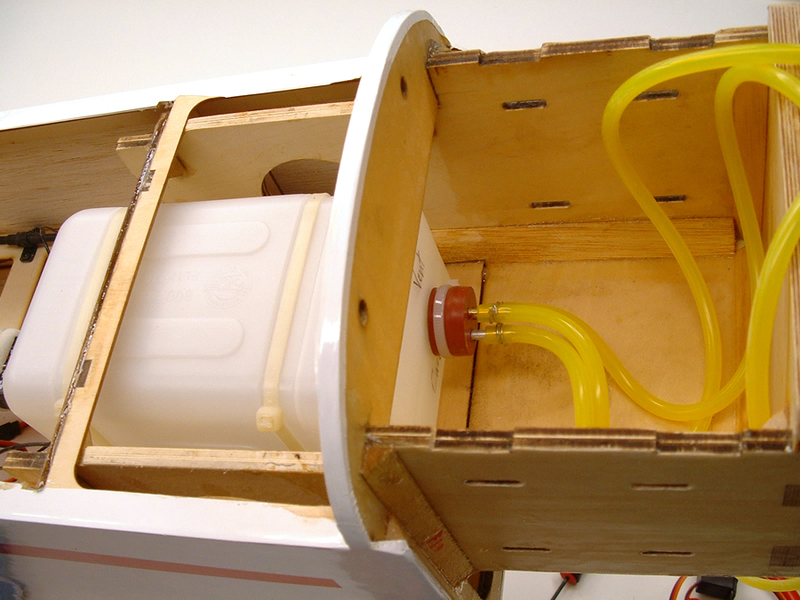 The receiver and battery were also easy to install because there’s a lot of room inside the CAP’s fuselage. Be sure to follow your receiver’s installation instructions for antenna placement for optimum performance of your radio system. The CAP 232 also has plenty of room below the firewall to mount the ignition system. I added an optical kill switch, so I can shut off the engine ignition from my transmitter. There’s a few different manufacturers of optical kill switches, and they’re reasonably priced for the safety they add. Pick one up for your next airplane, and I’m sure you’ll like it! Because I cut the exhaust tubes short for a different project, I had to extend them for the CAP. I picked up a short length of high temp silicone tubing on Amazon.com for a few bucks. 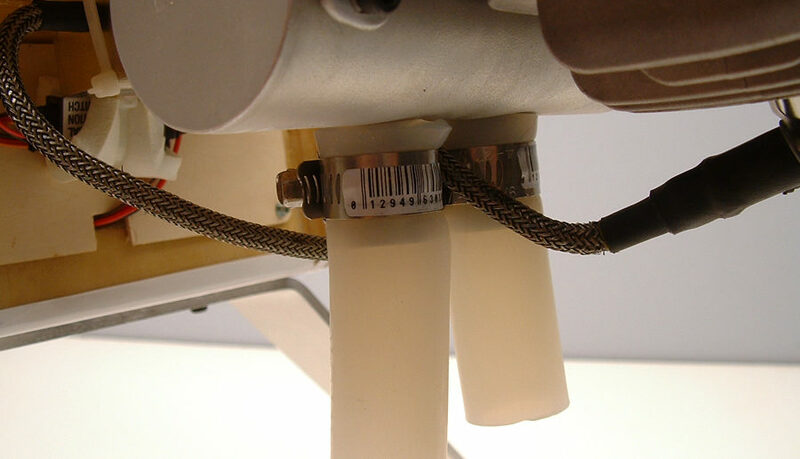 A pair of small hose clamps keeps the tubing in place. Installing the RCGF 70cc twin was nearly as easy as the DLE 55, but required adding small spacers to get the propeller hub to the correct position. I also had to move the throttle servo and engine ignition box, and a DuBro 4-40 steel pushrod and ball link were used to connect the throttle to its servo. Over all, the engine swap was pretty easy, and I did notice a slight improvement in performance with the 70cc engine. Propeller selection, while a personal choice, is important. You’ll want to use a high quality prop, of course. I really like wood propellers for a couple of reasons. First is safety. In the event of a prop strike (against an immovable object) the propeller will break rather than damage the engine. In the event of a prop strike against me, the wood prop will do less damage compared to a carbon fiber prop. There are Nylon props available as well, but the edges can be as sharp as a knife’s blade! My propeller of choice is the Falcon Beechwood prop. Falcon props are available at justmodelprops.com. By the time you’re ready to assemble and fly a giant scale aircraft, I’m going to assume that you’re able to fly an airplane. With that said, I want to mention things that will be focused on larger airplanes. The first is in regards to your flying site. Larger aircraft require more room! From runway length to air space, you’re going to need more room in most cases. My flying field has a 135′ nylon mat runway, which is too short for most giant scale aircraft, so I use the grass beyond the runway for take offs and landings. The one problem I have at my local field is that the total length of the mowed field is just 400 feet, with tall grass and trees on each end. We also have a wind generator located 660 feet off the southeast corner of the runway. This makes our landing pattern from the East a little difficult, but we manage to get by… Thankfully, there is another flying field located about 35 miles to the northeast of where I live. This field has a 700′ grass strip, which is more than sufficient for every airplane I’ve ever owned! Another thing to think about is safety – large airplanes swing large propellers! My recommendation is to never fly alone. If you were to have an accident at the field, who would be there to help? Though I’ve never had or personally witnessed a major accident at the field, I’ve seen many photos of problems that would have been a lot worse if the modeler had been at the field alone. Use the buddy system! OK, so now on to flying. Flying a giant scale model is a lot like flying a smaller model, only bigger. Bigger usually flies better – larger planes are less affected by wind, so there’s more days available for flying. With that said, pick a calm day for the maiden flight. 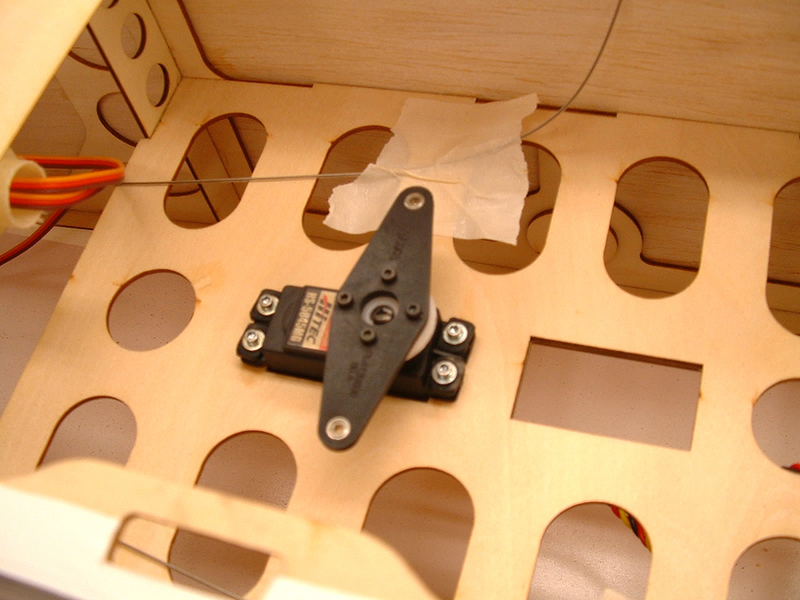 It’s much easier to focus on adjusting the trim on a plane that isn’t being bumped around by wind. Now, here’s another place it’s good to have a buddy at the field. 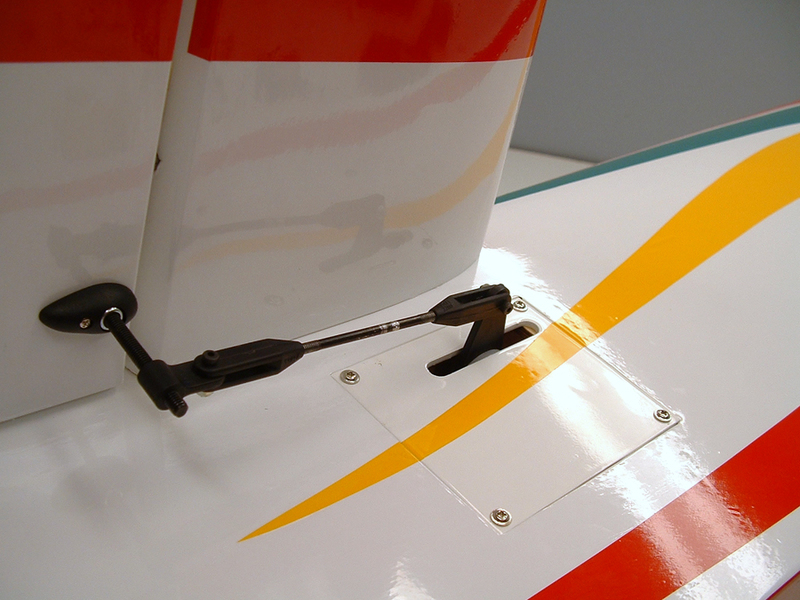 They can reach over and help you by adjusting the trims on your transmitter while you continue to fly the plane. It’s a little awkward at first, but it can be a HUGE help if your model is way out of trim! At this point, it’s a good idea to land your new plane and give it a good inspection. You’ll want to check over the entire airplane and make sure that all the nuts and bolts are tight, and also check the control surface hinges and edges of the covering. 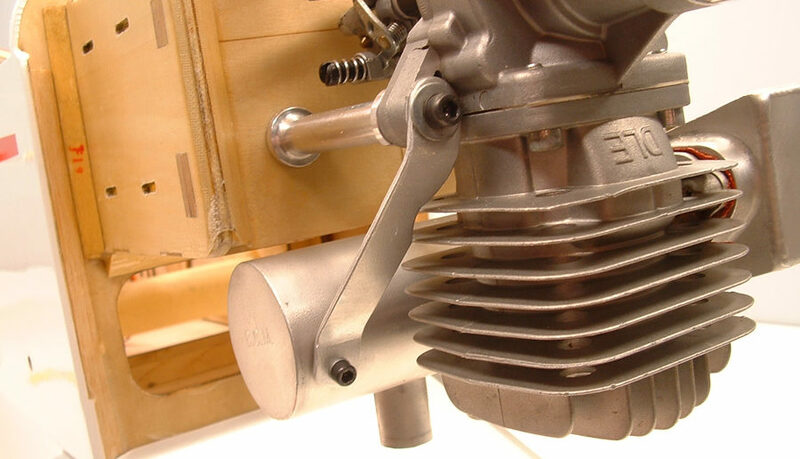 Pay close attention to propeller bolts, pushrod clevises and pushrods. 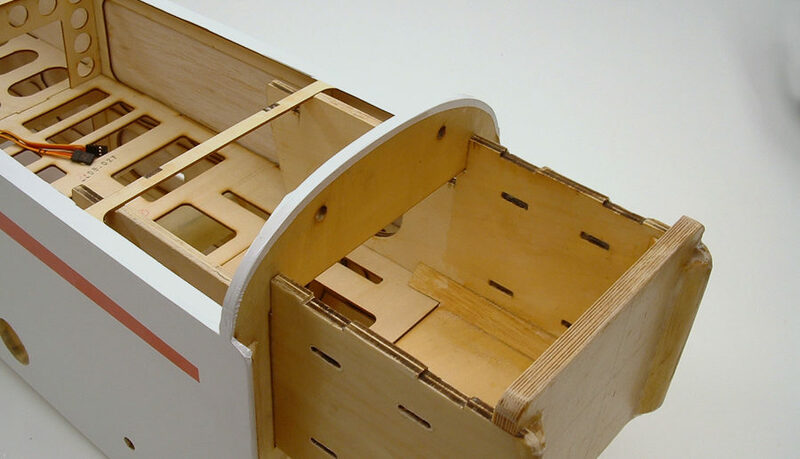 The airframe should be in the same condition as it was when you finished building/assembly. If there is anything that needs attention, DO NOT fly the plane again until the problems have been fixed! when you’re satisfied that your new giant scale aircraft is still flight worthy, go have fun! I won’t begin to pretend that I know everything there is to know about giant scale aircraft, but I hope what I know will help others. If there’s anything that you’d like to add, please feel free to leave a comment below. Thanks for reading my article, and stay tuned for part three – 100-120cc aircraft! I would also advise an engine run up and taxiing test without the cowl before the first flight in case anything shakes loose or you have a fuel leak…..deadly with petrol and a hot engine. Geoff well your right you cant bragg because 26 years is a drop of water in a very large pond. I soloed on a Falcon 56 in 1975. I was not yet eligible for a calif drivers license. I ordered monokote from this little struggling new mail order house in 1973 for my Magician 35….they had a catalog 10 or 12 pages. They called themselves Tower Hobbies, I think you’ve heard of them. I paid $2.75 for Sullivan flying wires for my Ringmaster, steadily complaining. I think their around 25 bucks nowadays. You ever buy ,own or use a Kraft Radio ? If you owned one back then you were the *^$# for lack of a better term. Contest greats had “Signature Series” Kraft’s custom made for a few thousand dollars….they couldn’t do half the functions a cheap 4 channel today could do. Then around 1978 or 1979 these little brown transmitter started showing up all over the place. 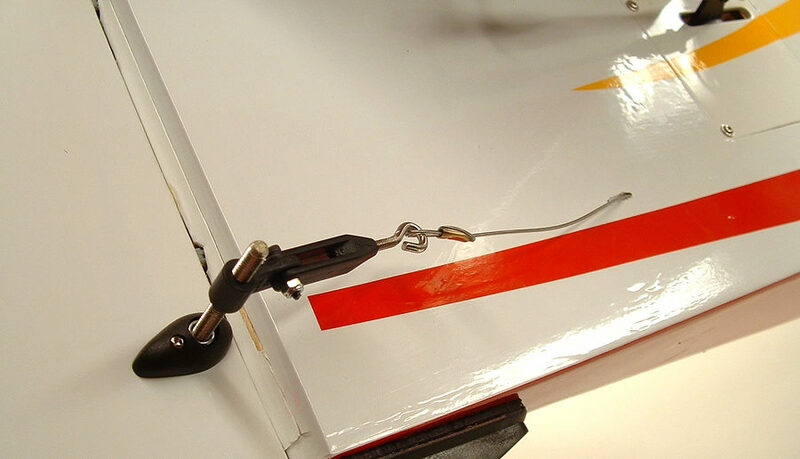 You could reverse the servo without removing it from the aircraft, WOW . This new line of radios called themselves Futaba. When I ran my plane in and cracked the cases I’d drive from Palmdale down to Compton hand it to them go have lunch and when I got it back all tuned up they would charge me 10 maybe 15 bucks. I wont go on any more kiddo, I still fly, I got a Goldberg big Ultimate ST 3000 an Ultra Stik w/ floats and 5 others. One day you’ll be an old timer too….you’ll have to wait your turn just like we did.